Heralded as one of the ‘top 10 people to know in Silicon Valley’, and considered “one of the most important thought leaders of our time,” Brian Solis shares his vision, research and experiences through keynotes at conferences and events worldwide to help people understand and embrace the dynamics defining the rise of digital transformation, innovation, connected consumerism and digital lifestyles. He is consistently ranked as one of the top speakers at some of the biggest events around the world including the Telstra Digital Summit in Australia, BDL Accelerate in Beirut, SXSW in Texas, Le Web in Paris and so many more. Brian is indeed ‘Mr Futurist’. Not one to fly-by convention, Brian has personally influenced and shaped business and media through his work, lead numerous programs for Fortune 500 companies, notable celebrities, startups and is globally recognized as one of the most prominent thought leaders and published authors in new media. He’s followed by over 500,000 people online…organically. His message simply resonates and that’s why he’s also followed by some of the most influential people in business, politics, entertainment and other industries globally. A digital anthropologist, sociologist, and futurist, Solis has influenced the effects of emerging media on the convergence of marketing, communications, and publishing. 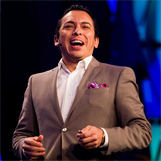 His blog, BrianSolis.com is among the world’s leading business online resources. He’s a seven-time, best-selling and award-winning author who has also pushed the publishing industry forward in his work. Whether it’s a technology or business event or an internal corporate summit, Brian brings a naturally engaging and entertaining message of clarity, meaning and inspiration.